After policy makers in Washington D.C. this week once again couldn’t agree on a bill to fund the fight against Zika, Republican Senator Marco Rubio on Friday criticized both parties for politicizing the issue. Speaking to reporters in Doral, he expressed his frustration about the ongoing battle on the hill. "My own party has taken far too long to take this issue seriously. We should have dealt with it in March, when we first raised it." He blamed the Democrats as well. "They have come up with this excuse that this is somehow hurting Planned Parenthood", he said, addressing the problem of commissions being attached to the Zika funding-bill - something both parties have done. 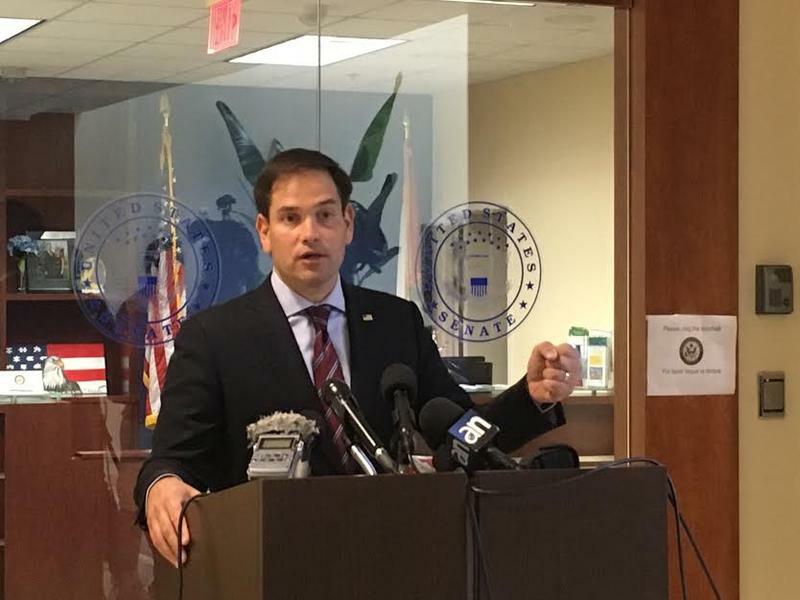 "We should stop this back and forth", Rubio said. However, Rubio went on to say he was "cautiously optimistic" for a compromise and pointed to another law, that needs to be passed to fund the government through the end of the year. "I hope that Zika will be included in that", Rubio said. He also weighed in on the ongoing debate over whether the Obama administration’s $400-million payment to Iran in January was in fact “ransom” for U.S. hostages released the same day, as claimed by members of the Republican Party. The State Department had stated earlier the money was to settle an old dispute over a decades old arms deal - but that it was also used as leverage in the prisoner release. Three Americans were flown out Jan. 16, which was the day the nuclear deal between Iran and six world powers, including the U.S., was implemented. This week Rubio introduced a bill to the House to ban such payments. The bill demands compensation for U.S. victims of attacks and hostage takings of the past decades, to which Iran has linked. "Before we are unfreezing assets and turning them over to the Iranian regime, the people who took Iran to court and gained judgment in our system of law, should be fully compensated for their losses at the hands of this terrible, radical government." The bill would also require that Iran return the January payment, he said. These remarks came after a meeting with the pro-Israel community of South Florida, which like Rubio is highly skeptical of the nuclear deal reached with Iran. Rubio also commented on Donald Trump’s much debated performance at the Commander-In-Chief Forum this week. Asked by a reporter, if he agreed with Trump’s assessment that Russian president Vladimir Putin was a better leader than President Barack Obama, Rubio said: "I have tremendous disagreements with President Obama on policies, but Vladimir Putin is not a president, he’s a dictator and we need to deal with him." Listen to Marco Rubio's statement about Vladimir Putin. Rubio went on to say that - even if he disagrees with Trump on a number of policy issues - he still supports his run for president. "I disagree on every policy issue with Clinton", he said. During the debates when Rubio was running himself to be the Republicans' candidate , he had called Trump a "con-man", who was "dangerous".